WILD STALLION (1952) is a pleasant Western about the taming of a wild horse, starring a genuine cowboy turned actor, Ben Johnson. When Dan Light is a young boy (played by Orley Lindgren) living on the frontier, his homesteader parents are killed by Indians. Dan's beloved white colt escapes during the attack. In the ensuing years Dan is jointly raised by Johnny Wintergreen (Edgar Buchanan), who hunts wild horses for the army, and the commander of the local fort, Major Cullen (Hayden Rorke). When Dan grows up (now played by Johnson) he's obsessed with tracking down and capturing his long-lost horse, who now leads a wild herd. At one point Dan actually captures the stallion and tames him enough to ride him, but the horse escapes yet again, and Dan is in for conflict when horse traders catch the horse and sell it to the army. Eventually Dan and his horse will reunite in an attempt to save a stranded army patrol which has been attacked by Indians. When he's not focused on searching for the stallion, Dan is contemplating whether he'd like the major to send him to West Point, and he's also got his eye on a future marriage to the major's daughter (Martha Hyer), his friend since childhood. This is a quick little 70-minute movie which provides enjoyable company. 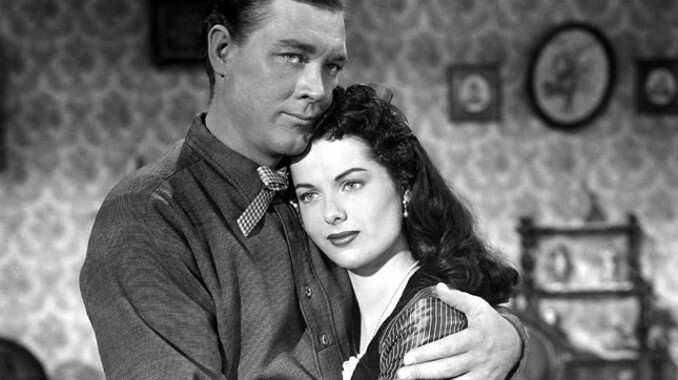 Johnson isn't as effective as he was under John Ford, in films such as WAGON MASTER (1950) and RIO GRANDE (1950), but then the story's not quite as dramatically compelling, either. It's a nice, easy-going film, and Johnson is always good to see on the screen; he's particularly well-suited for this film in terms of his riding skills and way with horses. No acting necessary in that regard! The small supporting cast is solid, also including Hugh Beaumont, Don Haggerty, and I. Stanford Jolley. WILD STALLION was directed by Lewis D. Collins. The assistant director was Andrew McLaglen, an early credit in his career. The movie was written by Dan Ullman, who has written numerous '50s Westerns reviewed here, most recently SEVEN ANGRY MEN (1955). 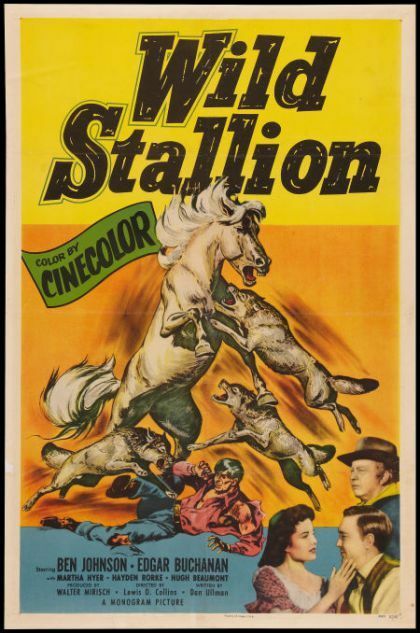 It was filmed in Cinecolor by Harry Neumann on Southern California movie ranches. WILD STALLION is available on DVD from the Warner Archive. It's one of the better Cinecolor prints I've seen. WILD STALLION is also shown from time to time on Turner Classic Movies. A very fair review I thought,of a pleasant little Western. releasing these gems from the vaults. that I have seen of an old Cinecolor film. starring Anthony Quinn and again the Cinecolor is wonderful. white society very interesting in BLACK GOLD. In this respect the film is very similar to FOXFIRE. known movie,especially as Richard Conte and Peggie Castle are so good in this film. Thanks for your comment, John! I've definitely become quite a fan of Cinecolor (Trucolor has its appeal also!). I have my dad's copy of FORT VENGEANCE sitting right next to the TV and hope to see it soon -- appreciate you mentioning it's in Cinecolor! I also hope to see BLACK GOLD before too long. Very interested in the comparison to FOXFIRE, a movie I really liked. Definitely looking forward to TARGET ZERO, what a great cast! I have all these titles jotted down in my notebook and will hope to see them soon-ish. Maricatrin, what a wonderful tribute to Ben Johnson! I'm so glad you shared it with me and my readers. The "Roman riding" in RIO GRANDE is the best! !